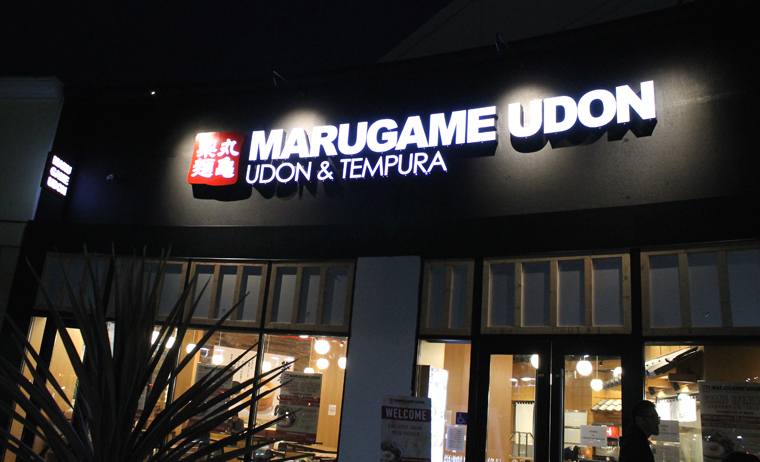 Note that the Stonestown Galleria outpost is named Marugame Udon, which is the original name of the company. 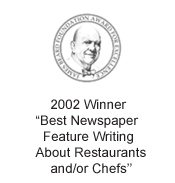 However, when it debuted its first one in the States — in Hawaii — there was concern that Americans might mispronounce “Marugame” as “marh-ooh-game” rather than the proper “marh-ooh-gaw-may.” So, the decision was made to rename the Hawaii one, “Marukame,” a marketing representative explained to me, when I was invited in for a a media preview four days before the official opening. 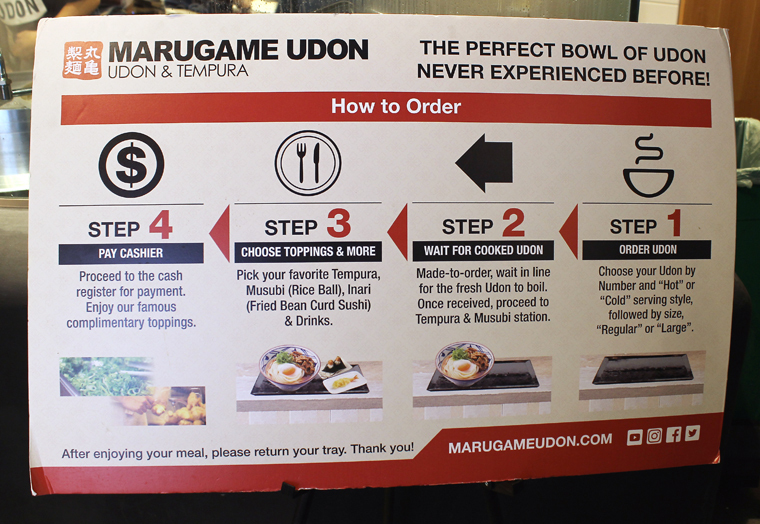 The Japanese must have more faith in us now, as from here on out, plans are to revert back to the “Marugame” name. The bright dining room done up with blond tables and chairs. 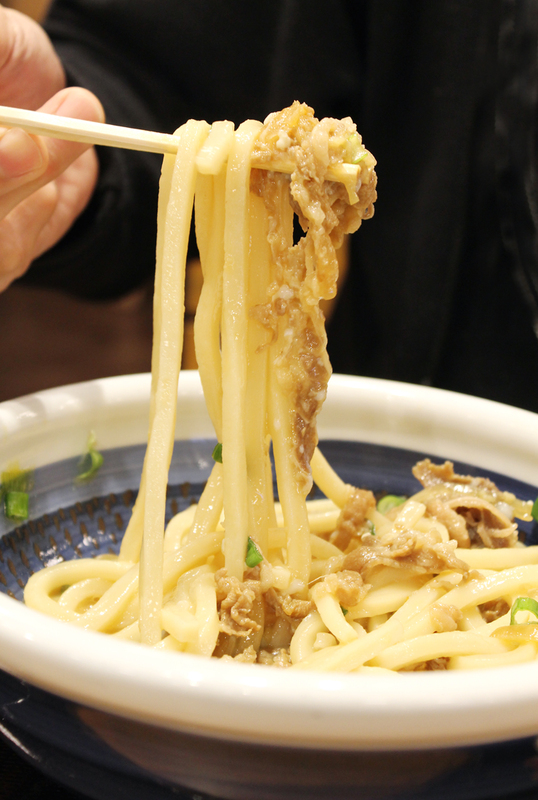 Marugame specializes in Sanuki udon noodles, notable for their square shape and flat edges, that are made by a machine imported from Japan. Think thick fettuccine-like as opposed to fat spaghetti-ish. 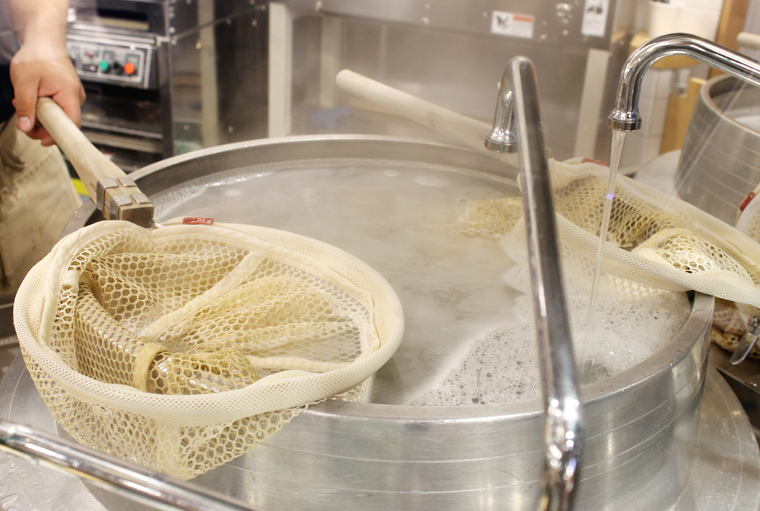 The noodles are aged before being cooked al dente and served in various soups made daily. The stream-lined service starts when you pick up a tray and make your way through the stations. 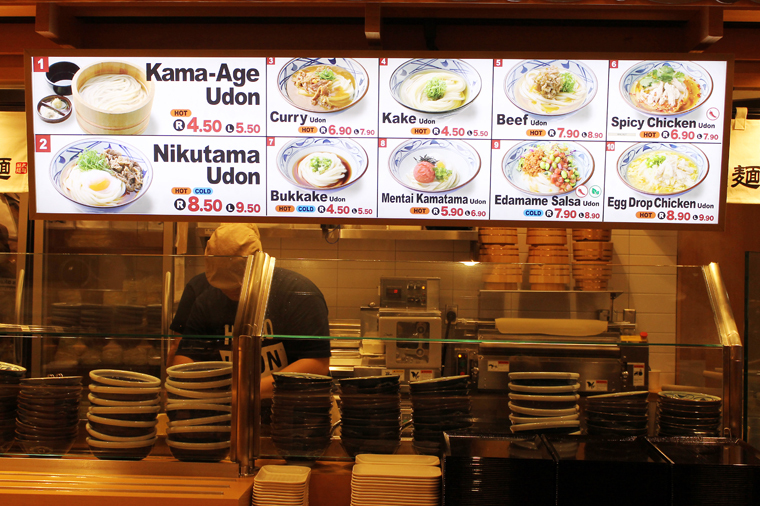 You choose from 10 different udon dishes, some served hot, some cold, priced from $4.50 to 9.90. Then, pick your size: regular, which is plenty filling, or the large, which my husband managed to finish before waddling to the car. 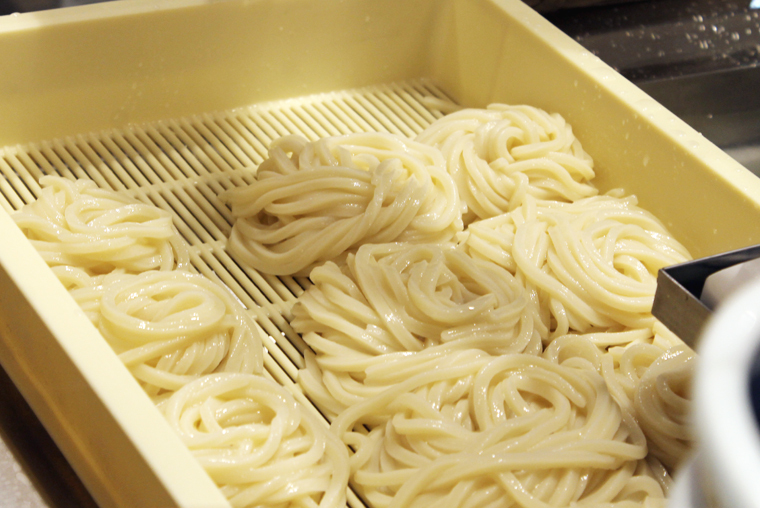 You can watch your udon being boiled, then plopped into a bowl, before your choice of soup or sauce is added. Cooked, drained, and ready to be assembled in bowls. 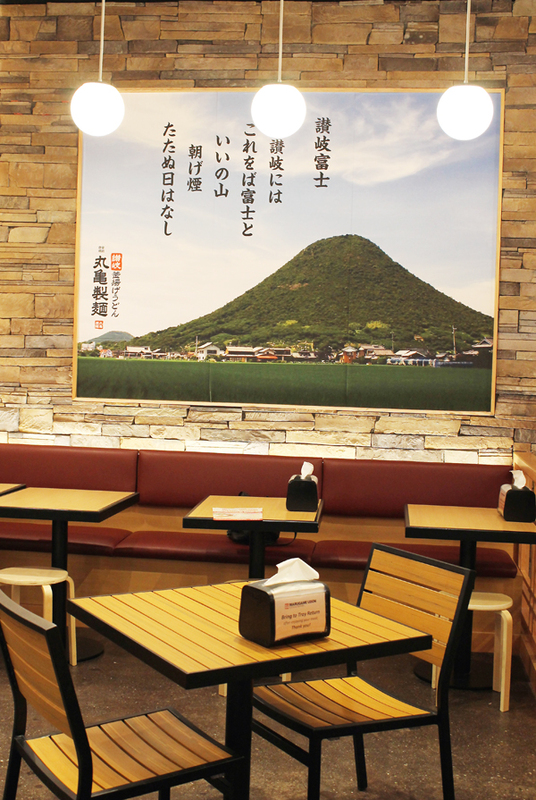 As you place your bowl on your tray, you wind your way to the tempura station, where you can pluck pieces of fried chicken, squid, sweet potato, asparagus and the like from underneath heat lamps. They range from $1.30 to $2.20 each. 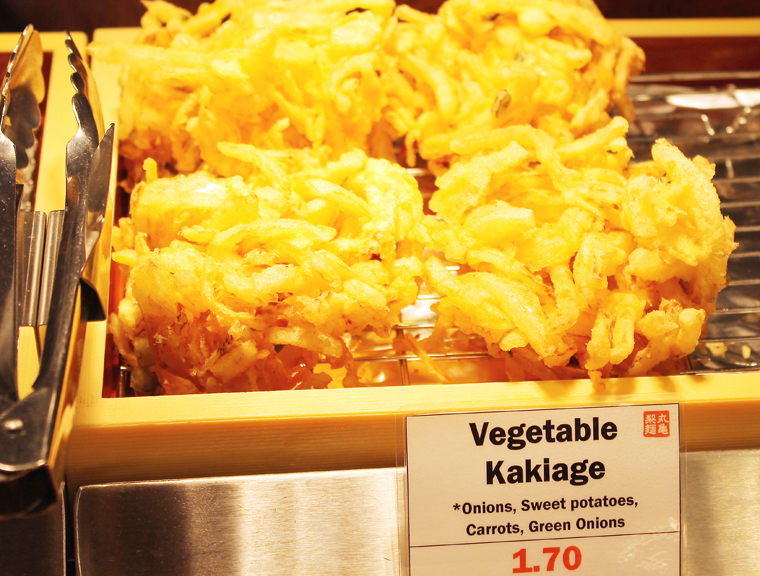 Vegetable kakiage is among the tempura offerings. 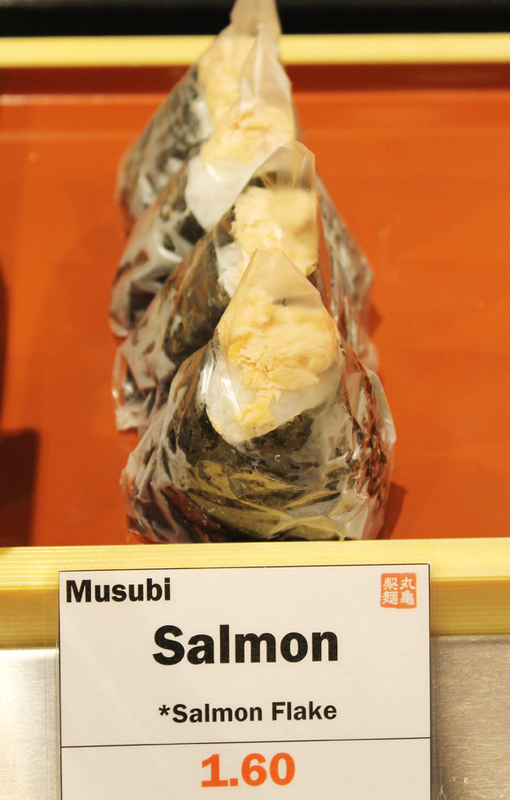 Salmon musubi is among the various rice balls to choose from. Next, it’s on to the musubi area for rice balls ($1 to $1.50 each), such as fried bean curd inari and nori-wrapped tuna salad musubi. 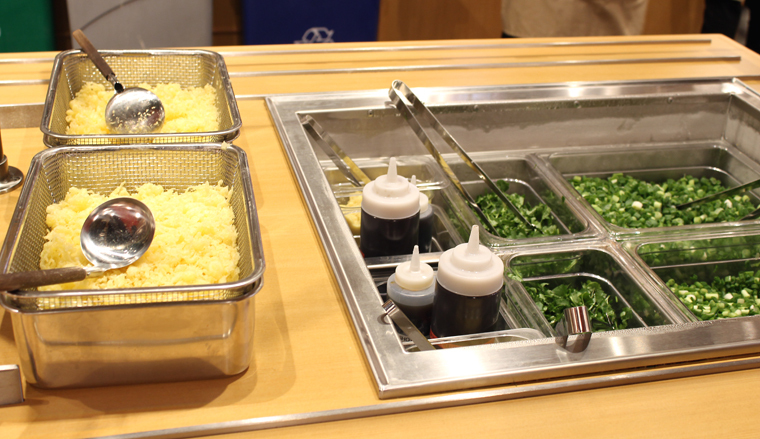 After paying, proceed to the complimentary toppings bar, where there’s everything from green onion, cilantro, Sriracha, tempura dipping sauce, tempura crunchies, Sriracha, and my favorite freshly grated ginger — to customize your udon. 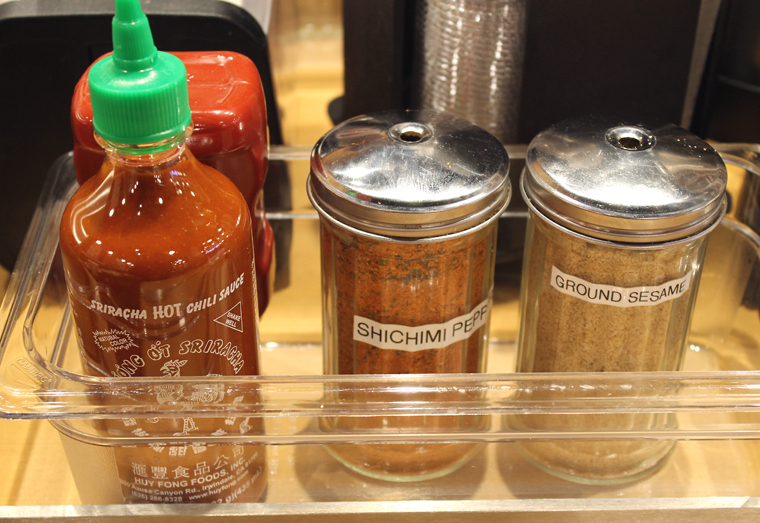 Other goodies to personalize your udon. I admit I added a heap of ginger to my bowl of egg drop chicken udon ($8.90 for a regular size), along with some green onion, cilantro, and toasted sesame seeds. 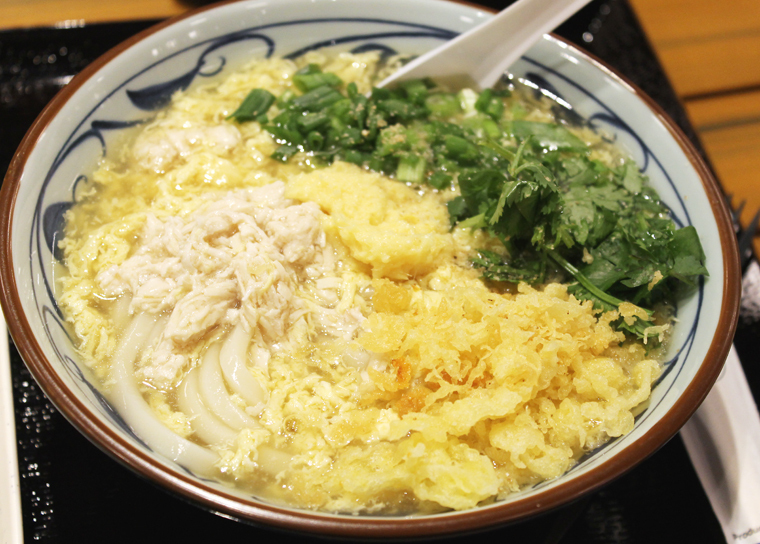 The noodles were thick and chewy, the broth full of egg strands and shredded chicken. 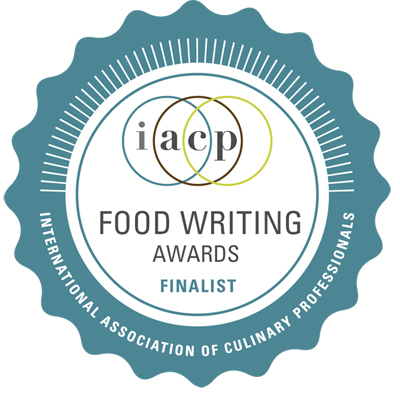 It was a sublime slurp-fest, comforting and nourishing, the perfect meal actually if you were suffering from a cold, flu or the blues on a dreary day. My egg drop chicken udon. 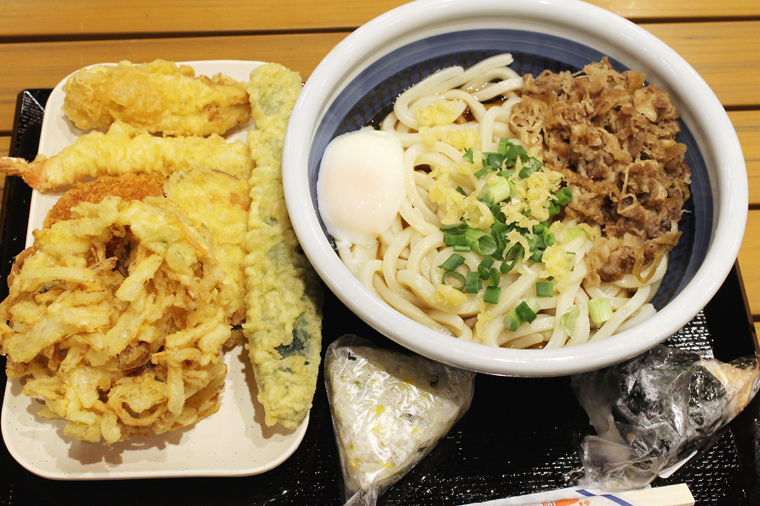 Nikutama udon with various tempura. My husband’s Nikutama Udon ($9.50 for a large) came with a runny egg, and strips of sweetly flavored beef in a soothing, savory broth. My shiso musubi was dotted throughout with my favorite minty-basil-like herb. The tempura we tried were all hot and crisp, not surprising since it was all made just prior to our media group getting into line. If there is a constant flow of customers, it’s a good bet that the tempura will get replenished with fresh fried selections regularly. My favorite was probably the big disc of Japanese sweet potato that was lacy crisp on the outside and ever so creamy-tender within. 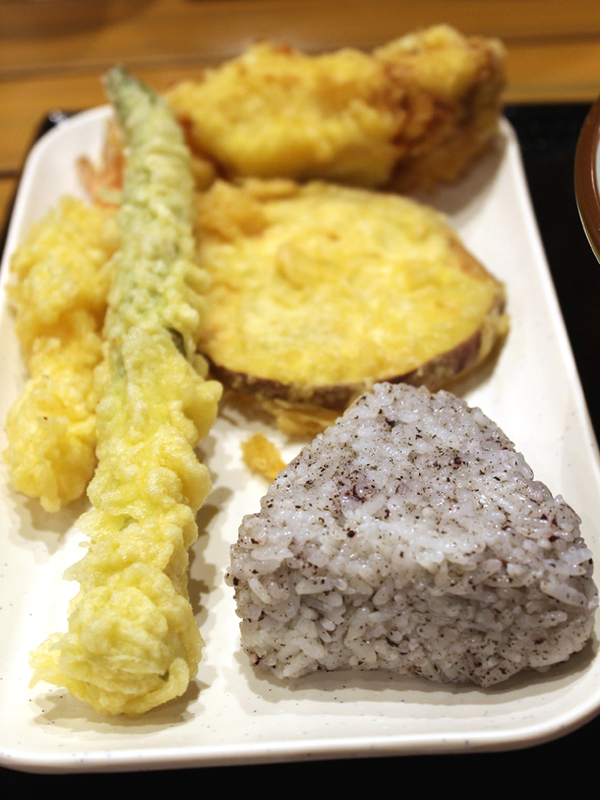 Shiso musubi (front, right); and asparagus, shrimp, sweet potato, and chicken tempura. 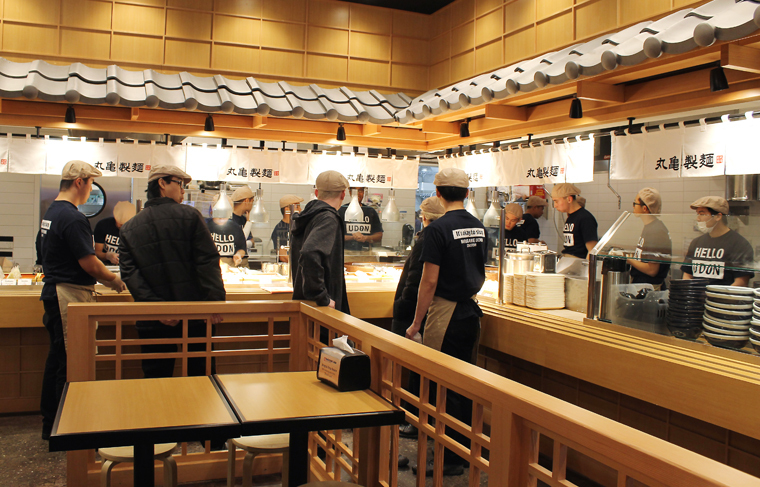 Look for another Marugame Udon to open in the Westfield San Francisco Centre this summer or fall. 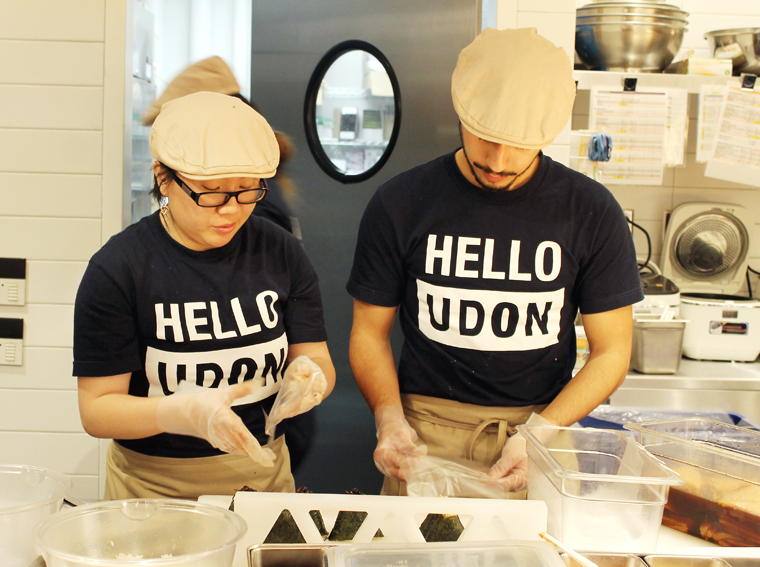 Move over ramen, because udon may very well be the new game in town now. 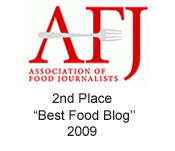 I saw the Eater article over the break about this opening up. Of course, it was basically a day after taking a day trip to Hayes Valley to try Kagawa-Ya which I thought of as Marugame-lite (still good, just maybe not quite as extensive a selection). Anyway, will be in Honolulu come Saturday, and I no longer feel a compulsion to wade into Waikiki solely to eat udon since it’s close by now! Looks good, but Stonestown is like the edge of San Francisco. I think I’ll just wait till the Westfield location opens.